This is a detail of an image transfer technique in the new book based on the baot yard in Felixtowe, Suffolk. 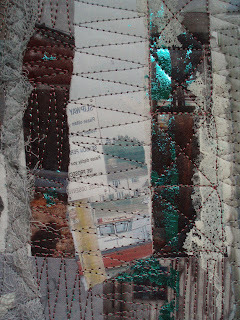 Two images have been accepted for "500 Art Quilts" a book by Lark Books. There is so much to see in this book, and it has been very sympathetically produced - a must buy! I entered 3 quilts so was very pleased to get two accepted including Serendipity. This one, Faded Mrray and Blue wasn't accepted! but they had over 2000 entries so I did well! Now for something new - "Creative Fabric Techniques" has just been published by Rainbow Disks. At the moment it is only available from me and the publisher for the price of £12. 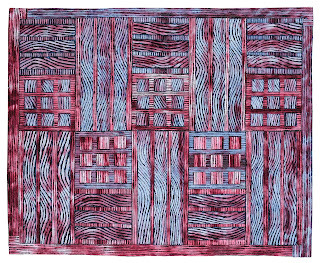 It will be available for sale at the Melbourne Quilt show. Amongst other techniques in the book are the ones for the Serendipty quilts [not before published] as well as the Out of the Dustbin and image transfer technqieus. It has just gone out to the quilt publishing world and the reviews from magazines and websites so far are very good!